Not many of us are aware of cancer that might be engulfing their body until it's too late and most are still oblivious to cancerous symptoms quite holistically and what it entails. Thankfully, there are campaigns taking place in Pakistan that have vowed to create awareness about this disease among the masses. 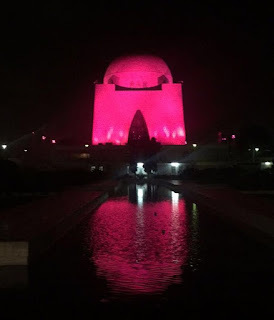 Recently, the Pink Ribbon Campaign collaborated with the Government of Pakistan, the National History and Literary Heritage Division and the administration of Mazar-e-Quaid in order to light up the mausoleum pink to spread awareness regarding breast cancer. There are about 40,000 women who succumb to this disease on an annual basis. This activity was sponsored by the textile brand, Gul Ahmed. Prior to this, a related activity was conducted at the Centaurus Mall, Islamabad. 1. Pakistan has the highest rate of female breast cancer in the entire Asia; 1 out of 9 Pakistani women is likely to suffer from breast cancer at some point in her life time. 2. Approximately 90,000 cases of breast cancer are reported every year in Pakistan and about 40,000 women die from this deadly ailment. 3. More than 9 million women are at high risk of becoming the victim of this disease sometimes in their life span, given this ratio. 4. Breast Cancer is the only form of cancer which can be detected at early stage and early detection fortunately increases survival chances up to 90%. However, the lack of awareness results in the high mortality rate. "Through the illumination of this iconic structure, our message of saving lives from breast cancer will reach out to millions of Pakistanis across the country. The issue of Breast Cancer still has cultural sensitivities attached with it, but we need to raise this issue in mainstream media," said Omar Aftab, Chief Executive Pink Ribbon. He also discussed about the organisation's plans about setting up Pakistan's first dedicated Breast Cancer Hospital where all facilities will be provided to all deserving Breast Cancer patients, free of cost because no woman should die just because she cannot afford to live. Having recently lost a relative to cancer (not breast cancer though) I can relate to how it may be considered a very discreet and sensitive issue not just for the sufferer but for the entire family as well where the victim is at the verge of death like fire consuming a forest exponentially. You never know when it is your last day even if you are a healthy person, whereas a cancer patient witnesses death staring at his/her face every single moment. It is indeed a devastating situation. Below are the symptoms of breast cancer. If God forbid, you or anyone you know is suffering from any of these, please seek help! 1. Swelling of the entire or part of the breast. 2. Discharge other than milk. 3. Scaling, thickening or redness of the breast. 4. Dimpling or skin irritation. 5. Formation of lumps in the breast. Gul Ahmed, being a responsible brand whose target market mostly comprises of women takes safe working conditions and safe products very seriously. It makes sure that all dyes and chemicals are non-carcinogenic. Yes, if you thought the fashion industry was completely non-toxic, read about the article recently published by National Geographic that talks about the horrors of the 19th century fashion industry. Victorian Britain and Europe were polluted with arsenic in fabric dyes and mercury that was used to harden hats made of rabbit fur. Apparently, the hatters and people working in the fashion industry were most vulnerable. Thankfully, the world has changed, though sand blasting is another hazardous procedure for producing jeans even till date in some countries. Let's join hands in any way we can with these organisations to minimise breast cancer cases if not completely being able to eradicate them.